One way or another, Operation Highjump and the Roswell incident must have had a huge psychological impact upon Truman and the US ruling cabal, because later that year, Truman signed legislation that gave birth to what would become a domestic and international Monster: the US MIC (Military Intelligence Complex). The National Security Act took effect September 18th, 1947 and reorganized the US defense and intelligence agencies. The Act and its subsequent amendments restructured the Intelligence Community, reorganized the Department of Defense, established the NSC (National Security Council), established the CIA (Central Intelligence Agency) (see below), split the Department of War into the Department of the Army and Department of the Air Force (the American air force used to be part of the army), established the NME (National Military Establishment), established the position of DNI (Director of National Intelligence) who is the director of the entire Intelligence Community and the principal advisor to the President. It was later amended in 1949 to further consolidate and centralize control of the military, by making the Secretaries of the Army, Navy and Air Force subordinate to the Secretary of Defense in the chain of command, and renaming the NME as the Department of Defense. As stated above, with the signing of the National Security Act, the CIA came into being on September 18th, 1947, arising out of the ashes of its forerunner the OSS (Office of Strategic Services). The OSS, run by “Wild” Bill Donovan, was a wartime intelligence agency during WWII which engaged in espionage, propaganda, subversion and post-war planning. It is difficult to aptly summarize just how nefarious, morally bankrupt, wicked and murderous the CIA has been since its 1947 inception. It quickly became an out-of-control agency, so much so that by the time Kennedy assumed office at the start of 1961, Eisenhower was already warning him that he better be careful of both the CIA and the entire MIC. JFK was the last person to seriously challenge the agency, and it is no coincidence he ended up dead just a few years later (for details on how the CIA was centrally involved in his murder, see my series on the JFK assassination). The CIA spies, relentlessly and invasively, on all Americans and beyond. Wikileaks published the Vault 7 CIA documents (the biggest leak in CIA history) which were a shocking and damning collection proving that the CIA hacks all US electronic devices (phones, computers, smart TVs) to listen to conversations anywhere. Vault 7 also proved the CIA hacks vehicles to remotely control them, in order to carry out undetectable assassinations. The CIA’s primary activities (aside from doing the job it’s supposed to be doing, i.e. gathering foreign intelligence to help defend the US) can be boiled down to these 5 things: 1. arms/drug running, 2. mind control, 3. installation/assassination, 4. subversion/propaganda, and 5. terrorist creating, arming, funding and training. Let’s take a brief look at each of these. CIA, the Cocaine Import Agency, has been drug running worldwide since 1947. The early forerunner of the CIA (the OSS) began to investigate the use of mind-altering substances like mescaline, scopolamine and marijuana. It then famously moved into experimenting with psilocybin (from magic mushrooms) and Lysergic acid Diethylamide (LSD). The CIA was also behind the introduction of LSD to the American public in the 1960s, partly as a giant experiment, partly as an offshoot of its MKUltra/mind control programs (see below), and partly to weaken the population. CIA arms running or gun running has also been a consistent theme through the agency’s history, including the Iran Contra affair or even Benghazi in 2012, when the CIA was using an American diplomatic compound in Libya to run guns to “moderate” Syrian rebels trying to destabilize the legitimately elected government of Bashar Al Assad. The CIA pioneered invasive mind control. In the 1940s, it absorbed Nazi war criminals into its structure via Operation Paperclip. It then conducted operations such as Project Bluebird and Project Artichoke. Artichoke became Project MKULTRA on April 13, 1953. The “MK” stood for mind control using the German word (kontrolle) in deference to the Nazis scientists at the CIA who helped develop the program. CIA agent Richard Helms chose Dr. Sidney Gottlieb to run the TSS (Technical Service Staff) to develop what became MKUltra, with truth serum drugs and hypnotic techniques. Some of the techniques involved trauma to make the victim disassociate (split off) into multiple personalities (altars). The CIA killed biological warfare scientist Frank Olson, using drugs and chemicals to produce altered and vulnerable states in subjects – who they could mind control for various purposes. JFK, the most famous example of CIA assassination operations. The CIA has become synonymous with installation of foreign puppet regimes and assassination – and the list is far too long to spell out, but it includes Iran 1953, Guatemala 1954, Vietnam 1954-58, Hungary 1956, Laos 1957-1973, Haiti 1959, Cuba 1961, Ecuador 1963, Brazil 1964, Indonesia 1965, Greece 1967, Bolivia 1968, Uruguay 1969, Cambodia 1970, Chile 1973, Australia 1975, Afghanistan 1979, El Salvador 1980, Nicaragua 1981, Panama 1980 and more up to the modern examples of Libya 2011, Syria 2011 and Ukraine 2014. Additionally, in the late 1950s, President Eisenhower and VP Nixon created a super-secret team of assassins composed of around 40 crack CIA agents. Operation 40 as it came to be known was behind many of the most famous high-profile assassinations of the last 6 decades, including JFK, MLK, RFK, John Lennon, Che Guervera, Bob Marley and more. This assassination template is still used today, carried out against innocent citizens and peacemakers. The CIA had a hand in the infamous Operation Gladio, a US-NATO “stay-behind” military force in Europe which was there to allegedly stop the spread of communism. Horrific false flag attacks were carried out by Gladio operatives, who would bomb places such as train stations and make it look like far-left communists were the villains. 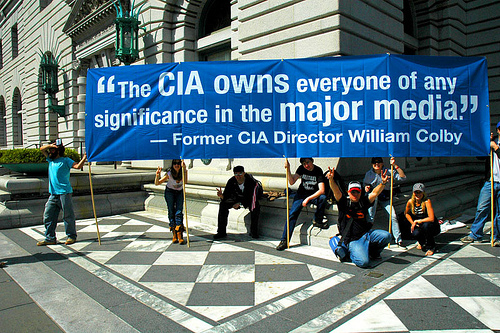 The CIA has become a master at subversion and propaganda, both within and outside of the US. It took over the media in the 1960s and 1970s with Operation Mockingbird, a now declassified project whereby the CIA infiltrated the mainstream media and had its pieces inserted into TV, newspapers and journals everywhere as “news” when they were nothing more than lies and propaganda. The late German journalist Ufo Ulfkotte admitted that many European journalists were on the CIA payroll, and have been ever since the CIA rolled out its first European propaganda station, Radio Free Europe in 1949. Ex-CIA case officer Philip Agee worked in the CIA during the 1950s and finally left in 1968. He knew firsthand the CIA’s subversive activities and terrorism in Central and South America. He became a whistleblower and author of several books exposing the agency. When the US revoked his passport in 1979, he first lived in Grenada in 1980 until Bishop was overthrown by the US, then in Nicaragua until 1990 when the Sandanistas were overthrown by the US, then Germany and Cuba. The CIA created the CCF (Congress for Cultural Freedom) in 1950 to counter Soviet influence. The CCF was the hidden weapon in the US Cold War arsenal. Whether they liked it or not, whether they knew it or not, there were few scientists, writers and historians in both Europe and America whose names were not in some way linked to this covert enterprise. The US Establishment operated a sophisticated spying program in the name of freedom of expression. All those things (including music and art) that you thought were just spontaneous were actually part of a hidden agenda. Radical Islamic terrorists or radical CIAslamic terrorists? The CIA has long gotten mercenaries to do its dirty work. For a fuller history of the long and close relationship between the CIA and Islamic terrorism, see my article Radical Islamic Terrorists: The Best Bad Guys Money Can Buy. Whether they’re called mujahideen, Al Qaeda (“the database”), the FSA (Free Syrian Army) or ISIS, the CIA has created them, armed them, funded them and trained them. The CIA trained Osama Bin Laden in the 80s and the US Government allowed a fundamentalist Islamic network to develop in America prior to 2001. Both Bin Laden and Al Qaeda were the convenient bogeymen after the false flag attack on 9/11. Here is a list of the top 10 connections between the US and ISIS. Even all of this doesn’t fully outline the extent of the CIA’s crimes, for it has also been involved in various NWO agendas such as geoengineering. Evergreen was/is a CIA front company used to disseminate chemtrails. On what some researchers claim was September 24th, 1947 (although there is a lack of clarity over the exact date), another hugely significant event happened. Truman created a secret governmental group that had never before existed, which was deliberately set up to be above and beyond the law. Known as Majestic, Majestic 12 or MJ 12 / MJ-12, it was an ultra secretive group who was entrusted with guarding the knowledge of the reality of the ET presence of Earth. It was so undercover that Congress didn’t even know of its existence, let alone be empowered to subject it to oversight or accountability. MJ 12 certainly, at one point, could have been considered to be the most powerful organization in Earth, in the sense that they were tasked with handling the alien affair, an issue of life0changing import that no one else was allowed to know. It is unknown exactly in what form Majestic 12 exists today. According to the testimony of Dan Burisch, MJ 12 are working for the Committee of the Majority, a Freemasonic organization which is coordinating alien contact with earth and furthering the agenda of the New World Order. 1947 truly was an incredible year, with so many incidents happening and groups being created, that it changed the course of the future of humanity. 70 years later, we are still shaped by what went on in that fateful year. We are just on the verge of discovering, collectively, the shocking reality of a breakaway civilization, of a Secret Space Program (see William Tompkins and other whistleblowers for more details), that has been carried on behind our backs with our resources. The difference is that now the truth has leaked out, and there is a critical mass of people prepared to investigate these occurrences and confront their implications. MJ 12 was set up in an era where the authorities were terrified of sharing the truth in the belief that it would cause social upheaval and chaos. Now, things have changed; if our so-called rulers cannot reveal the truth to us, we will bypass them, find it out anyway and continue on a course of rendering them irrelevant.